In a recent article The 3 Instructional Shifts That Will Redefine the College Professor, the ‘dynamic classroom’ was listed as number one. The dynamic classroom is where faculty “do practically anything other than lecture” (Craig, 2015). A meager definition but the idea is right on—active learning, where students apply concepts through discussion, debate, writing, hands-on experiments, etc. produces better learning results. Numerous studies back up the claim; a recent paper shows student performance increased by just under half a standard deviation with active learning compared with lecturing (Freeman et al., 2014). In this post I share a four-step strategy that instructors can use to make learning active for online, blended or face-to-face learning spaces. Readers will find instructive examples and resources on active learning in the photo gallery (below) as well as in the list of resources at the end of this post. Active learning is not a theory but a teaching method that supports learning. The method uses techniques such as writing reflections, discussion, problem solving—activities that promote analysis, synthesis and evaluation that guide students towards achieving learning objectives. Typically tools are used to support the activity, for example handouts, whiteboard, chalkboard, smart phone apps, platforms such as Google Drive or Twitter. The choice of activity and tool are (or should be) determined by the learning goal, as well as other factors that include, time available, location (in-class or online), class size and others that are specific to the students, such as their skill level and access to tools. Another way to define active learning is to consider the opposite—passive learning where students are recipients of knowledge, are expected to record and absorb knowledge delivered by an expert—a faculty member or textbook (McManus, 2001). Passive learning aligns with behaviorist theories where the student is viewed as an empty vessel waiting to be filled. In contrast active learning aligns with the constructivist perspective of learning. The constructivist view embraces the idea that knowledge is actively constructed by the learner and integrated with his or her existing knowledge and experience. Click on an image below to open up the photo gallery. Each image is captioned with a link to further information about the method featured. Nursing students work on concept board activity in small groups during a class on Mental Health at University of Wisconsin-Madison. More details at http://news.wisc.edu/23299 . Below is a four-step framework for re-designing a lesson or unit to make learning active. Integrating active learning requires a skill set that goes beyond skills required for facilitating the traditional lecture format; numerous institutions provide professional development for faculty and instructors looking to incorporate active methods given the time and skills required. This framework below is a starting point; it features the bare bones principles of making learning active. An important note, the lecture method still has a role; lectures are an effective method to deliver information, yet it’s using lectures (and active learning) strategically as a method along with others that creates a comprehensive instructional strategy (“150 Teaching Methods”). To illustrate the framework an active learning scenario featuring a group of nursing students in a face-to-face (F2F) course is used and described in the ‘application’ section of each step. 1. Identify learning objectives for the lesson/unit. Considering the learning objective or goal ensures the activity aligns with the course objectives and the lesson itself. If the unit/lesson doesn’t have a specific goal, but the course has overall learning outcomes, create one by considering the question—what should students be able to do or know after the lesson that will support them reaching a (given) course objective? A useful tool for identifying and writing learning objectives is a Bloom’s Taxonomy resource from UNCC ‘Writing Objectives Using Bloom’s Taxonomy’. Application: Using the nursing students scenario the two goals for the learning unit on eating disorders are: 1) identify symptoms associated with disordered eating, and 2) determine a patient’s symptoms on the eating disorder continuum. These goals support one of the course objectives • Analyze patient behaviors to determine presence of disordered eating on the eating disorder continuum, and helps students gain the knowledge and skills needed to meet this learning outcome. 2. Identify core concepts students need to learn. List key concepts— frameworks, formulas, theoretical principles etc. students need to learn. Determine the breadth and depth of knowledge required—the level at which students need to know the concepts, e.g. familiarity or mastery. Consider students’ current level of knowledge on the topic; this helps determine how concepts will need to be presented to students before they engage in the activity. Application: In the scenario nursing students need to recognize symptoms of disordered eating and determine which patient behaviors are normal and ones associated with eating disorders. Students need to know characteristics of eating disorders and be familiar with the ‘eating disorder continuum’. Faculty determined that knowledge of the students is varied, thus assigned a textbook reading prior to class and selected a short video to show prior to the activity that illustrated key concepts. 3. Consider options—select activity and tools. This step has two phases. First determine types of activities that could work for the concepts given the learning context—class size, learning space, time constraints, etc. The activity might be a debate, mind map, or small discussion. Next identify the tools needed to support the activity, while also considering factors such as students skill level and access (to the tool). If skill level could be an issue, consider providing instructions, tutorials for students to learn the tool and build learning time in accordingly. If the learning curve is deemed too high given the time allocated, consider an alternative tool. 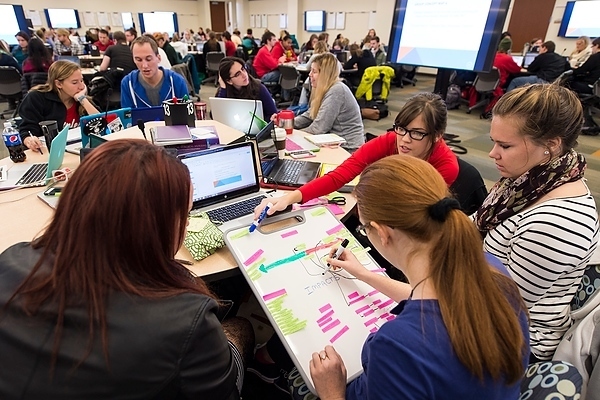 Nursing students work on concept boards in small groups in School of Nursing class at University of Wisconsin-Madison (2014). Picture by Jeff Miller. In the nursing face-to-face class of 150 students a concept board activity was chosen. Students worked in small groups after watching video about a woman struggling with binge eating. The activity was introduced by professor with questions to guide the discussion. The groups collaborated using a white board to create their concept board. This activity can be applied to online setting—student groups can create a concept board using Google Draw program on Google Drive. Students can work on the concept map asynchronously or synchronously. 4. Articulate activity instructions in detail. Instructions that highlight the goal of the activity and its purpose frame the activity and prepare students for learning. Instructions for F2F and online environments need to be specific, clear and detailed and should include three components, 1) goals of activity, its purpose and expected outcomes, 2) details of the assignment: requirements, due dates, concepts to incorporate, format for product, etc. and 3) execution details: group or individual assignment, how groups will work together, e.g. group etiquette, collaboration strategies, tools and platforms to use (more so for online classes). Active learning is a proven method that supports learning. Yet it’s one of several that supports knowledge building and creation that engages and motivates students. Below is a list of resources for educators looking to incorporate active learning strategies into online, blended or F2F course. Best Practices for Teaching with Twitter, Jason Rhode, Ph.D.
McManus, D. The two paradigms of education and the peer review of teaching, (2001). NAGT Journal of Geoscience Education, v 49 n 6., pp. 423-434. In this post I review key takeaways from the book “make it stick” and delve into its practical applications for educators—how instructors who teach face-to-face or online can help their students learn better, and for course and curriculum designers—how they can support learning through unique course design strategies. The book begins “…people generally go about learning in the wrong ways…” and authors describe how the methods we typically use to learn—reviewing material again and again to get that ‘A’ for instance, or practicing the same skill for hours on end until mastery, are essentially ineffective (pg. xi). They don’t work, and ‘make it stick’ explains why. Despite the title, “… Science of Successful Learning”, the book is more about the practical than the science though the authors do a fine job of referencing research to support their claims. For these and other reasons, the book is enlightening—refreshingly so. I approached the book with few expectations; with the numerous titles out there on learning—How we Learn, The Science Behind Learning, Accelerated Learning, etc., I’m a bit skeptical. Though most concepts presented in the book aren’t new, like the debunking of learning styles*, the methods described on how we learn provide a new perspective on teaching and developing coursework. For instance forgetting is good; good when we space out learning then forget enough that we have to retrieve it later and relearn it. Another, changing up topics frequently is also effective—just when we think we are beginning to ‘get it’, it’s a good time to move on to another topic. 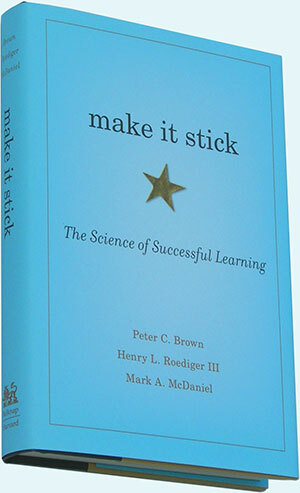 “Make it stick” is a how-to book geared to students and life-long learners that describes how to not just remember, but how to apply, analyze, and synthesize concepts. This post presents a different perspective, how the principles in “make it stick” can be applied to teaching and to the development of curriculum and courses—online and face-to-face. We could just as easily substitute ‘teaching’ for ‘learning’ in the opening quote, ‘people generally go about teaching in the wrong ways’. In this context ‘people’ refers to teachers, professors, trainers, tutors, coaches and parents, as well as curriculum and instructional designers. I’m in the latter category and used principles from the book when developing an online, four-unit professional development course for faculty. The book is a fairly easy read with enough challenge and complexity to make it a page-turner. It’s also cleverly written; authors embed some of the learning methods described in the book in the writing. For example they use ‘interleaving—which is a method of introducing a new idea or concept, then layering in an additional concept (or concepts)—for instance concept ‘a’ is introduced in a chapter, and just when you start grasping it, authors switch to concept ‘b’, then come back to concept ‘a’ in the next chapter, while introducing concept ‘c’. Concept a, b and c (and d, e and f) are interleaved throughout the book in this way, turning up in subsequent chapters with different examples to illustrate each. Just when you might have forgotten concept ‘a’, it appears again, along with yet another topic. This technique, switching topics frequently and interleaving, represent two methods authors described in the book, one is to mix it up (vary) and space-out, content frequently, before you’ve mastered the material (pg. 46 – 49). Then review the material later, retrieve concepts when you’re on the brink of forgetting them altogether. Apparently this repeated retrieval, going back to concepts again and again, embeds the knowledge and skills (pg. 29), and is far more effective than concentrated study sessions of re-reading, reviewing and highlighting text passages. The second concept interleaving, which is the idea that learning two or more subjects, or practicing two or more skills, is a more potent that massed practice focused on one topic. 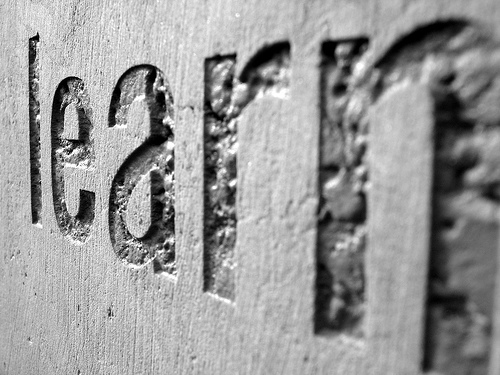 Learning is deeper and more durable when it requires effort. This idea explained in chapter four, ‘embrace difficulties’ which authors describe difficult learning as desirable due to the idea that the brain encodes and consolidates learning when learning it’s ‘effortful’; is strengthened through mental representations associated with retrieval and making connections (pg. 73). * Learning styles debunked; there is no empirical research that supports the idea that learning is more effective when instruction caters to the learners preferred style of learning, e.g. auditory, visual, etc. Learners are susceptible to the ‘illusion of knowing’. It’s not uncommon for learners to ‘not know what they don’t know’. Being aware of what one still needs to learn, or what skill needs developing is known as metacognition, and it’s part of overcoming the illusion of knowing. Chapter five lists tools learners can use to gain a sense of knowing. Educators play a critical role in helping students overcome the illusion of knowing by providing constructive feedback (pg. 126). Learning requires a foundation of knowledge, which supports the idea that we do need to learn foundational concepts even in a world where we can “Google it’. It seems that when knowledge is deeply entrenched in long-term memory it supports the learner’s ability to make connections with other knowledge held in one’s memory (pg. 76). ‘Googling’ a fact or concept will likely be stored in the learner’s short-term memory, and while useful in certain contexts, it does not replace a learner having a knowledge base to call upon when working on complex projects or initiatives. The following tips section is a summary of concepts presented in the book. The final chapter of the book, Make it Stick, also outlines some general tips for teachers, though authors caution that teachers must find what’s right for his or her classroom (pg. 225). Agreed. But still the tips are worthy of careful consideration. Focus on active learning methods—retrieval, elaboration, reflection, generative learning. This idea of active learning is not new, but the book provides excellent suggestions for active learning that can be applied to the classroom and online. One example I particularly like is the use of ‘summary sheets’, where students are required to submit a single sheet at the end of a week that illustrates the prior week’s material with drawings annotated with key ideas, arrows and graphs (pg. 231). This could be done in an online course where learners share their summary diagrams with each other via a forum, or group’s are assigned to create a collective summary diagram for a given week and post it for sharing. Create ‘desirable difficulties’ where learners struggle with material, make mistakes and even fail, yet do ultimately receive corrective and constructive feedback from the instructor. Incorporate frequent, low stakes testing. Provide opportunities for elaboration, reflection. Explain to students how learning works—sharing with students what empirical studies have revealed on how people learn will help students manage their own education. The other benefit—teaching becomes transparent; students see the purpose behind the methods, e.g. reflection exercises, frequent quizzes, etc. Students may also see that learning is supposed to be challenging and difficult and that making mistakes and not always succeeding is part of the learning process. The book does a good job outlining how to explain learning to students (pg 225 – 230). Create frequent and varied active learning exercises — focus less on content that students consume through reading and watching, and more on doing. Active learning in online courses, though more challenging to create, supports effective and dynamic learning experiences (Austin & Mescia, n.d.). Use quizzes as exploratory, reflective learning exercises with the primary purpose to help students learn. This means creating quizzes that provide immediate feedback, even during the quiz, where students can check their answers. In order for this to be effective the feedback needs to be specific, describing why an answer is correct or incorrect. The feedback is an opportunity to reinforce concepts and can prompt students to dig deeper into a subject area. If using the quiz feature in a LMS, it’s possible to provide customized feedback, even include Web links to further resources. Incorporate concepts frequently throughout the course in a variety of contexts by creating learning exercises and assignments that require students to draw upon concepts from previous modules/units of learning. Do not approach learning modules or units as independent ‘chunks’ of learning, but fluid and porous ‘blocks’ that draw upon previous concepts that interlock and build a structure. It’s a common term in online course development to ‘chunk’ learning into segments, yet it’s critical to thread concepts consistently throughout the modules/units. Don’t make it too easy — make students work at learning, e.g. by posing more questions and opportunities for discovery through discussion and interaction with other students. Though structure and outline of purpose for activities is the framework, students need to find solutions and solve problems wrestling with concepts and ideas. This last component is perhaps the most challenging to structure within an online course. 1) Interleaving in an online course: As mentioned earlier in the post, I applied the idea of interleaving in an online course I recently created. Rather than topics introduced as separate units of instruction within independent modules, I threaded concepts from previous modules into the new ones. Concepts from prior modules were referenced frequently in different contexts, and in the learning activities participants are required to incorporate concepts from previous units along with newly introduced concepts, as well as to draw upon their knowledge and experience. I also incorporated frequent, cumulative quizzes for review in each module that covered concepts from all modules. Quiz settings were adjusted so that learners can check their responses before moving on to the next question and the feedback provides a review of the concept. 2) Generative learning is a method discussed in the book. It’s a process where students are given a problem to solve before being taught the concepts or method. The idea is that learning is stronger when students invest more energy and effort looking for a solution. Critics of this teaching method say it’s more time-consuming and not as effective as direct instruction. In Ontario, Canada this method of generative learning is introduced in select public schools to teach Mathematics. I give ‘make it stick’ five-stars, not only for the concise, crisp writing but the thought-provoking and actionable content. Teachers, instructors and course designers will no doubt find the book useful, at the very least it will provide a refreshing take on learning. The book’s website, makeitstick.net provides a good overview of the content by chapter. This ‘Need-to-Know’ blog post series features noteworthy stories that speak of need-to-know developments within higher education and K-12 that have the potential to influence, challenge and/or transform traditional education as we know it. The latest trend in higher education is micro-credentialing, the non-traditional education path where students gain skill sets in a specific area and receive a credential. Case in point, Udacity announced this week a new nanodegree (Udacity defines nanodegrees as ‘curriculums designed to help you become job-ready)’— the Android nanodegree in partnership with Google. Another example—Penn State’s College of Business also launched this week an online bootcamp course, ‘Supply Chain Leadership Academy’, to educate “supply chain leaders of tomorrow in leadership and best practices in holistic supply chain management”. The micro-credentialing trend is driven by business entities that have a real (or perceived) workforce skill gap, where jobs can’t be filled due to lack of qualified applicants. Google reports it has thousands of jobs to fill given a dearth of qualified applicants. The Linux Foundation, also offering a certificate course in partnership with edX, reports it has over 50,000 open jobs. MOOC providers and select higher education institutions are leveraging the apparent skills gap, using their platforms to build their online program offerings with credentialing options for a fee. A good idea. The target market is not traditional higher education students, but non-traditional students that are already in the workforce and are looking to further their careers and/or switch career paths. Alison.com is a platform offered credentialing in specific skill sets long before MOOC providers began doing so. Though Alison’s business model is different from MOOC providers such as Coursera or edX. Students aren’t the revenue source but advertisers, featured on the platform, are. Stanford Online, Professional Certificates, “Our professional certificates offer short, focused courses that give you tools and techniques you can apply right away“. 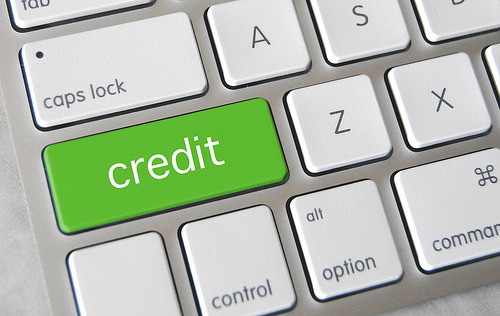 Fee: $1295 per online course; required number of courses vary by certificate. Udacity’s Nanodegree – “All the course content is free online, but the $200 per month pays for the non-scaleable parts of the degree: project grading, feedback, instructor mentorship, assistance and a final certification”. Option to receive reimbursement of 50% of tuition upon completion. Digital Literacy & IT Skills Diploma Courses, Alison.com. Free with option to pay nominal fee for paper certificate delivered via mail. 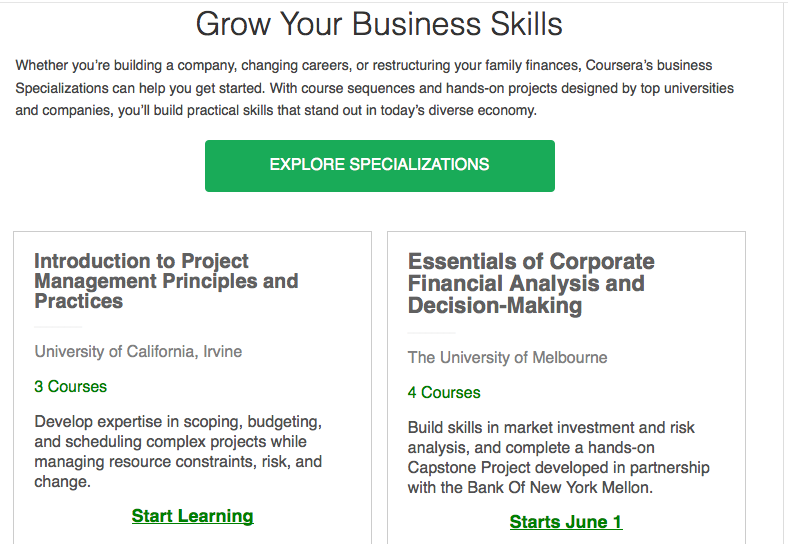 Coursera’s Specializations – “Master a skill with a targeted sequence of courses”. Fee: $95 per course, with a fee for the ‘capstone project’, e.g. Business Foundations Specialization = $595 for four courses and capstone project. Screenshot of recent email from Coursera announcing upcoming Specialization certificates. ‘Specializations’ consist of a two or more courses on focused area. Insight: This non-traditional student population, which micro-credentials target, is an emerging market and such options are a boon to working or unemployed adults seeking skill development. It’s a positive development in higher education. Employers appear receptive to micro-credentials. However, micro-credentialing is favorable provided the programs provide quality learning resulting in tangible, applicable skill sets. The majority of the credentials require not only a financial investment, but a significant investment of students’ time and energy. It’s buyer-beware; credentials do not guarantee a job, though the courses backed by business entities likely have higher placement rates than those without a business affiliation. The data reported here indicate that active learning increases examination performance by just under half a SD and that lecturing increases failure rates by 55%. The heterogeneity analyses indicate that (i) these increases in achievement hold across all of the STEM disciplines and occur in all class sizes, course types, and course levels; and (ii) active learning is particularly beneficial in small classes and at increasing performance on concept inventories. Implications: Is the lecture dead? Absolutely not, but to increase student learning, retention and success, involving students in active application of concepts should be the norm not the exception. However, implementing active learning is challenging for many educations, and especially for online courses, yet it can be done with deliberate, thoughtful development of a course learning strategy. Below are links with suggestions and examples of active learning applications. One of my favorite examples of active learning, is an online literature instructor Laura Gibbs, who creates assignments using online platforms—blogging platforms, Pinterest, etc. where students engage with content, each other and the Internet community. Freeman, S., Eddy, S.L., McDonough, M., Smith, M.K., Okorafor, N., Jordt, H., and Wenderoth, M.P., (2014). Active learning increases student performance in science, engineering, and mathematics. Proceedings of the National Academy of Sciences (PNAS), 111 (23), 8410-8415. Weiner, Maryelleb. (2015). More evidence that active learning trumps lecturing. Faculty Focus Higher Ed Teaching Strategies from Magna Publications.